The amount of data we produce every day is truly mind-boggling. World data facts: There are 2.5 quintillion bytes of data created each day at our current pace, but that pace is only accelerating with the growth of the Internet of Things (IoT). Over the last two years alone 90 percent of the data in the world was generated. This is worth re-reading! 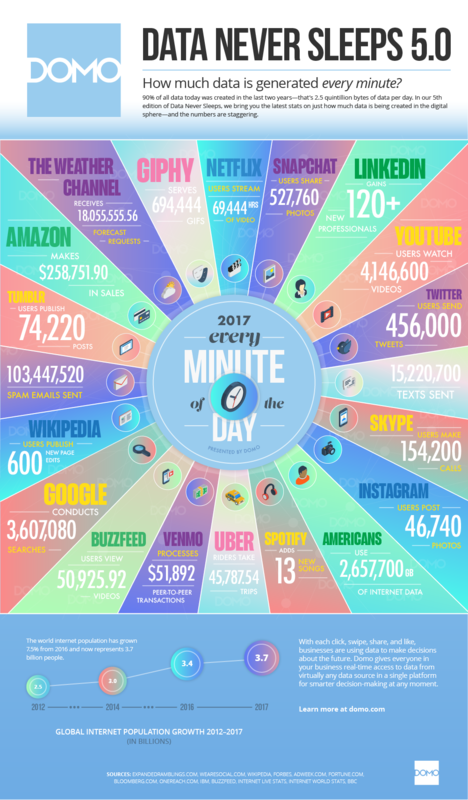 Here are some stats to help illustrate some of the ways we create these colossal amounts of data every single day. While 77% of searches are conducted on Google, it would be remiss not to remember other search engines are also contributing to our daily data generation. Worldwide there are5 billion searches a day.